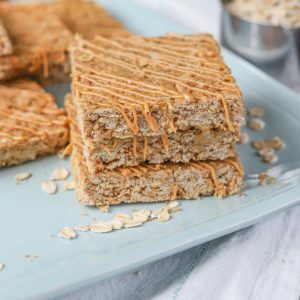 Easy and convenient, these One Bowl Peanut Butter Granola Bars are a healthy snacking option that can curb hunger any time of day! *Recipe from 02/15/12. Updated 04/27/18. Snacking. Do you ever get in a snacking rut? We do. And it usually ends up being a granola bar rut. They are just so easy to have on hand and snack on no matter what time of day it is. That means we go through a lot of granola bars! Because we go through so many granola bars at our house, we have tried out many different recipes. 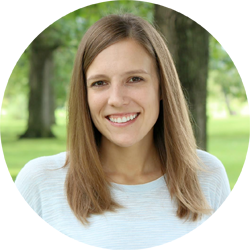 This one, however, is still one of my husband’s favorites. They are quick to throw together and only take about 12 minutes to bake. That makes them one of my favorites, too! 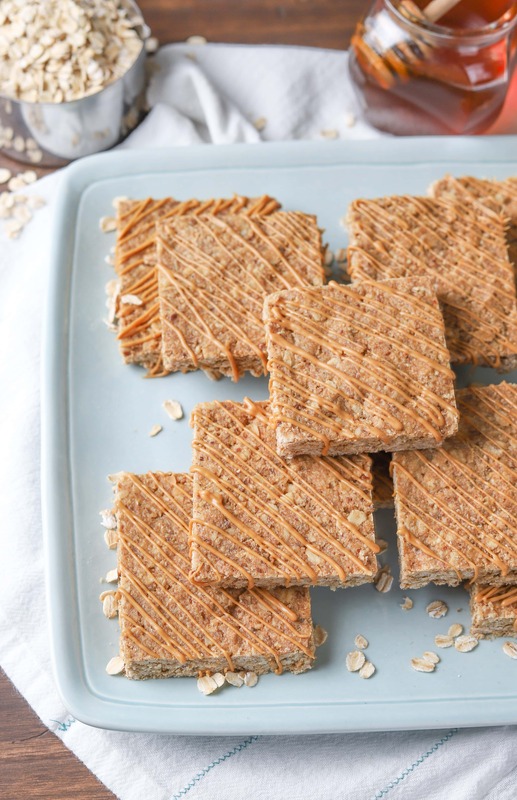 These granola bars are also versatile. Throw in some chocolate chips if you’re in the mood for a little chocolate. Shredded coconut adds a bit of tropical flavor and sweetness. Chopped nuts add crunch and more protein. Lots of options to make them fit your tastes and those of your family! Packed with protein, fiber, and complex carbs, they are just right to grab for a quick breakfast, the perfect pick-me-up in the afternoon, a great post run refuel. . .I think you get the point! 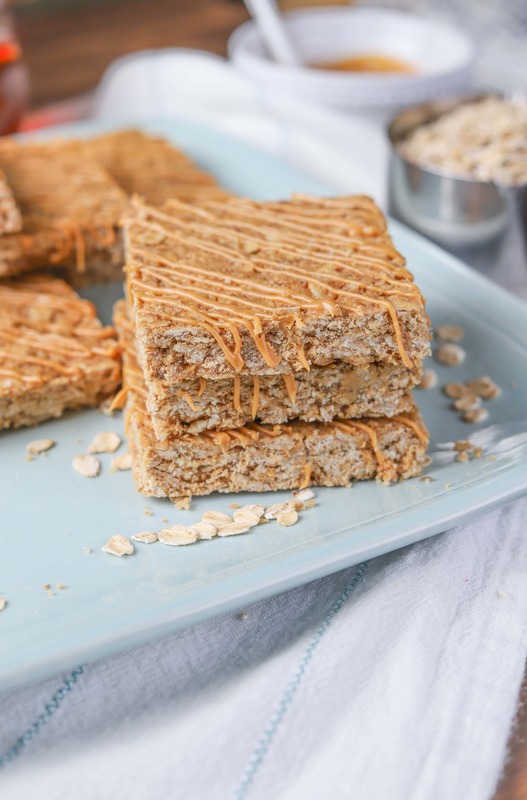 Easy, convenient, delicious, these peanut butter granola bars are a great recipe to have on hand! Preheat oven to 350 degrees F. Spray a 9x13 inch baking dish with non-stick cooking spray. In a large bowl, mix together the oats, flour, oat bran, flax seed, and salt. Add in the peanut butter, honey, maple syrup, and egg. Stir together until thoroughly combined. Bake for 12-16 minutes or until edges just begin to brown. Do not overbake. Let cool 5-10 minutes and then cut bars. 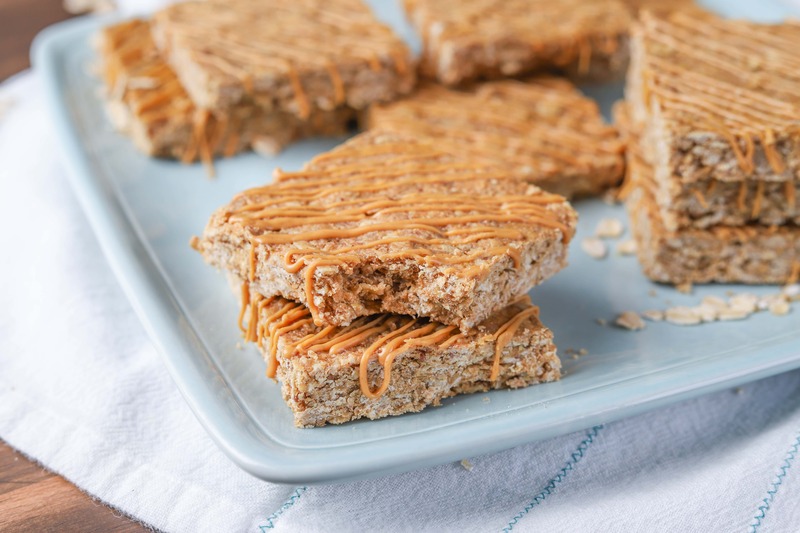 For optional drizzle: Melt peanut butter in microwave and drizzle over bars. If you use a thin drizzle, you'll need 2 tablespoons. If you want a thick drizzle, you'll need 4 tablespoons. Allow peanut butter to cool and serve. 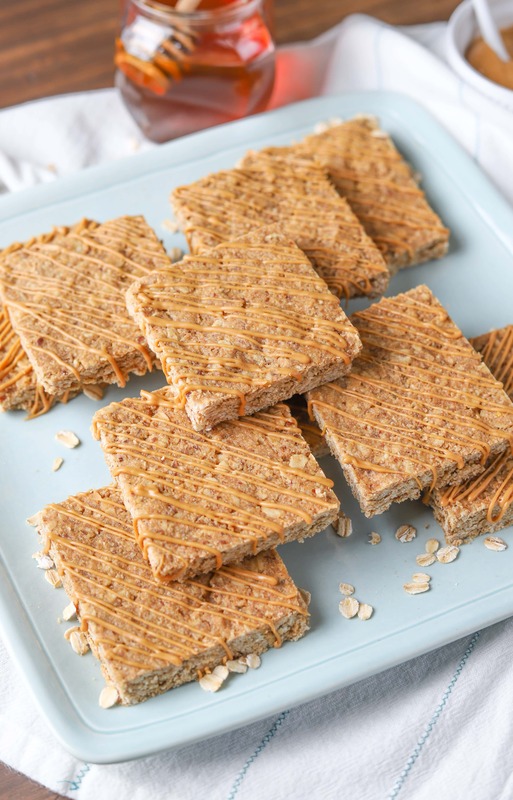 If you kitchen is warm, you may want to store the granola bars in the refrigerator to keep the peanut butter drizzle from melting. These were fantastic! Made them recently and took them on a trip and they were great snacks!